The past few weeks have been a whirlwind of spreadsheets and logistics, phone calls and impromptu meetings, and community organization and collaboration. We've also experienced a lot of emotion, gratitude and hope. In the 3 weeks since we launched our GoFundMe campaign, the Off the Grid community has served over 10,000 meals in Napa, Sonoma and Mendocino counties. The remaining funds will help us provide transitional services as they rebuild and recover. Thank you to everyone who donated so generously to this cause. Many have shared with us how much it meant to them to receive a hot meal, made with care, in the face of so much loss. We'd like to thank the first responders who worked tirelessly to contain the fires. All of us owe them an incredible debt. Thanks, also, to the Salvation Army, Munchery, Marlowe and our partners in the community who collaborated with us on these efforts. Finally, thank you to our mobile food partners who are the true heroes of the support network we helped to build. The hospitality industry is fundamental to the vitality of Northern California. If you're looking for ways to continue your support, we urge you to visit and patronize the many businesses, artisans and makers who call this beautiful region home. Thank you, all. Stay safe and be kind. With thousands of structures destroyed, economic impact in the billions and tragic loss of life, recovery from the fires in Northern California will take years. Our partners in the affected communities are continuing to request our support with transitional services as they work to restore normalcy. We are committed to helping for as long as possible. Again, Off the Grid is donating all of our operational and administrative resources to these efforts, so 100% of funds will go directly towards supporting the health and well-being of the community. To date, we’ve served more than 10,000 hot meals in conjunction with our incredible mobile food partners. We'll be concluding our campaign tomorrow at midnight, and we need your help to surpass our goal of $50K so we can continue to lift spirits a little while longer. Thank you for your generosity and commitment to supporting our North Bay neighbors. In less than 3 weeks, your donations have helped us serve over 10,000 hot, healthy meals to our North Bay neighbors. Off the Grid is continuing to work with our partners in the impacted communities to support mid-term relief efforts, with 100% of funds from our campaign providing much-needed transitional services as they begin the process of healing and rebuilding. We'll be concluding our campaign this Thursday at midnight, and we NEED your help to surpass our goal of $50K so we can continue to lift spirits a little while longer. The destruction from the North Bay wildfires is unimaginable, but we remain incredibly inspired by the way the Off the Grid community — and the wider hospitality industry — has come together to lend a hand. If you haven’t contributed already, now’s the time to show your support. Donations and volunteer efforts always surge immediately after a crisis, but ongoing efforts for the weeks and months following are critical to recovery. Please help us continue these vital services! We are humbled and grateful to be part of such an amazing community, and our partners in the North Bay have expressed their immense gratitude for the work of our vendors during this tragic time. Over the past couple weeks, your donations have helped us play a critical role in relief efforts in the North Bay, providing thousands of hot, healthy meals to first responders, members of the National Guard, displaced farm workers and community members. Thanks to you, our mobile food partners are set to serve another 2,000 meals at Mendocino and Springs Hall and Mendocino County Local Assistance Center through this Sunday. Off the Grid is continuing to work with our partners in the impacted communities to support mid-term relief efforts, providing much-needed transitional services as they begin the process of healing and re-building. Please help us reach $50K to continue these vital services. A donation of just $7.50 provides a meal. $75 feeds a group of 10. Any amount helps. With many folks returning home to utter devastation, your contributions will help us continue to lift spirits at a time when it's needed most. Thank you. And that's $40K! Over the past 12 days, your donations have provided thousands of hot, healthy meals to our neighbors in the North Bay. We NEED your help to continue supporting our mobile food partners through the end of the week — please spread the word and help us reach our new goal of $50K! For a real-time view of Off the Grid service locations in communities impacted by fires, visit www.offthegrid.com/events . We continue to be encouraged by the progress made towards full containment of the fires, however, those who've been affected face a difficult road ahead. Thanks to you, we've raised nearly $40K in 8 days to support ongoing relief efforts — help us reach $50K! Your contributions will allow us to support our community in serving hot, healthy meals in the coming days and weeks. Off the Grid is supporting Mendocino County-based businesses Pilon Kitchen and The Food Depot, as well as the Bay Area's Fat Boys in providing meals to displaced individuals at the Mendocino College Local Assistance Center. Over 1,000 people have been fed in the region so far, and another 2.000+ are on track to be served by the end of next week. Additionally, vendors Banh Mi Zon, Fruity Moto, Fat Boys, Croques & Toques, Mai Thai Kitchen, and Cochinita are serving 800+ meals to members of the National Guard, police force, and local relief staff at the Santa Rosa Development Center today through Sunday. We'll continue to share updates on how your contributions are helping to fill the hearts and stomachs of those affected by this tragedy. Thank you. Thanks to you, we've raised over $30K in just 5 days! As we continue to work with our partners at the local and state levels on long-term solutions to support the region, we've upped our goal to $50K. We know that our community is up to the challenge. We are heartened by the news that first responders have made significant progress to contain the fires, however, over 100,000 individuals remain displaced, and their futures uncertain. Off the Grid is supporting vendors Casablanca Morrocan, Beyond the Border, Capelo's Barbecue and Banh Mi Zon in providing urgently needed meals to 200 displaced farm workers at Sonoma Springs Community Hall tomorrow. Additionally, we're collaborating with The Salvation Army to identify locations in need of both hot meals and prepared foods. In partnership with Munchery, Marlowe Group and vendors An the Go, Capelo's Barbecue, Slightly Skewed, Banh Mi Zon, Mission Dogs, Me So Hungry Too, Casablanca Morrocan, Hula Truck, Momolicious and El Porteno, we're coordinating the delivery of over 3,500 meals to shelters in Coffey Park and Fountaingrove over the weekend, and through next week. Please check out this article for details around our relief efforts made possible by your support. Thank you. Me So Hungry SF and Taqueria Angelica's are serving 200 meals to first responders in Mill Valley on Saturday night. MOMOlicious and Banh Mi Zon are serving 500 meals to residential complexes in Santa Rosa and Healdsburg through our friends at LifeSTEPS Saturday, and Sunday. Additionally, in partnership with several food truck friends, Off the Grid was able to serve 1100-1600 PG&E workers at the command post catering in Santa Rosa. And lastly, a shoutout to Twister Food Truck for their generous donation of $1,000 to our GoFundMe drive. 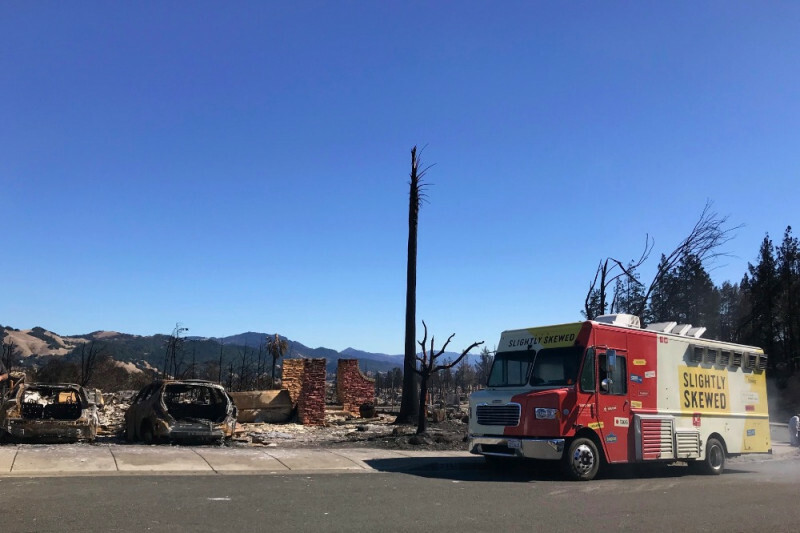 The horrific wildfires raging in several Northern California counties have affected many of our friends, partners, and colleagues in the hospitality industry. There is an urgent need to help those who have lost their homes and livelihoods as a result of this terrible tragedy. Connection and collaboration are fundamental to what we do at Off the Grid. We recognize the need to unify our efforts and coordinate relief in order to have the largest possible impact. If you are a Bay Area business, mobile food or hospitality partner or friend of Off the Grid and would like to support these efforts, please donate below. On behalf of our vendor partners, and the larger Off the Grid community, we thank you for your support.